Long time no see! I took a bit of an unexpected break from blogging because of school but today I'm back with a fun diy. This diy was actually inspired by Aleene's new Quick Dry Fabric Fusion glue. I managed to get a free sample (last month) which ended up being a full size bottle and was really excited to use it. So I came up with a simple project that not only uses the glue but those ribbon scraps you may have lying around. I also will be writing full review on this new glue once I make a few more projects with it. 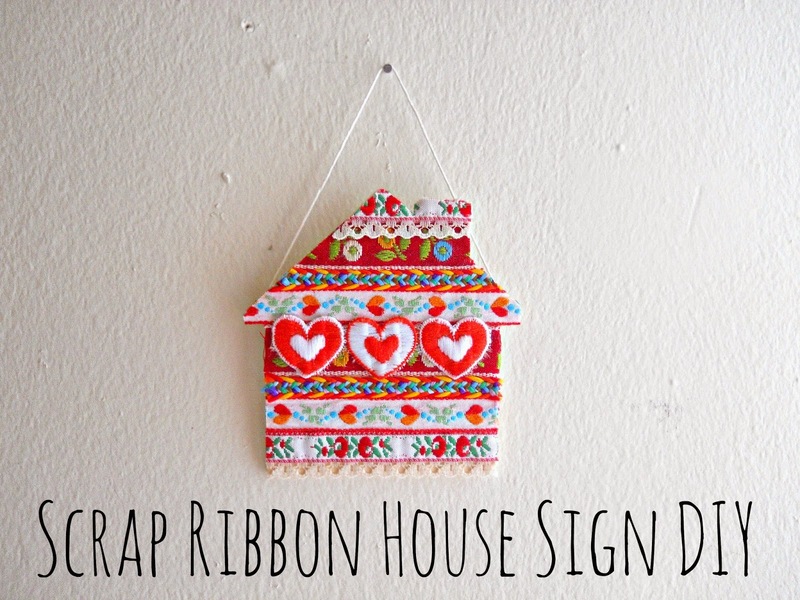 Until then, you can learn how to make your own scrap ribbon house sign! Step 1: Lay out your ribbon in the order you want to glue them in. Once your happy with your design, glue each piece of ribbon down in its place. Step 2: When your ribbon is dry, cut off any pieces that are hanging over the edge. Step 3: Flip your house over and glue a piece of hemp cord to the back. When the glue is dried, your all done! I just loved making this project because it was so fun to combine different ribbons to come up with a ''winning'' color combo. Now, you don't have to use a wooden house as your main look. At the craft store they sell tons of different wooden shapes like hearts or triangles, so just make whatever suit your fancy. I also thought this sign would be cute as part of a gallery wall or in a space where you have other inspirational pieces. Do you like this way of using ribbon scraps?